Matteo Garbelotto, UC ANR Cooperative Extension specialist, describes how to protect oak trees in sudden oak death-infected areas. For more information, visit sodmapmobile.org. Matteo Garbelotto, UC ANR Cooperative Extension specialist, reports the results of the 2015 SOD Blitz, a citizen science project he hosts annually to survey the spread of sudden oak death. For more information, visit sodblitz.org. The following two videos address the threat posed to plant nurseries, gardens, woodlands and countryside from two devastating Phytophthora pathogens, P. ramorum and P. kernoviae. These films were produced by the UK’s Food and Environment Research Agency and involved a wide consortium of Government and industry contributors. Biosecurity – what you can do to help (2 minutes 40 seconds) is aimed at people who have little previous knowledge of plant diseases but who are interested in what they can do to help stop the spread of the diseases. Phytophthora – Stop the spread (18 minutes 30 seconds) is aimed more at professionals who work in environments where the diseases may be present or that could easily be contaminated, describes the diseases in more detail and offers advice on appropriate biosecurity measures to help prevent the spread. 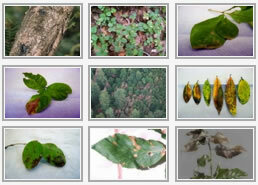 Sudden Oak Death – A general overview of Sudden Oak Death and Phytophthora ramorum produced by the Rutgers University Cooperative Extension (New Jersey). This 25-minute film, split into 3 clips, provides information on symptoms and hosts; risks; control techniques; and a special section on the threat to East Coast forests. This 3-minute film relays specific information for Master Gardeners from across the country, with special information on the National Pest Detection Network. Steve Oak, Forest Service, narrates this short overview of Chestnut blight in eastern forests, and the potential for Sudden Oak Death to do the same damage (52 seconds). Dave Rizzo, UC Davis, provides a quick overview of the main tree species in California affected by P. ramorum (56 seconds). An exploration of how P. ramorum spread and establishment might be related to human activity, by Hall Cushman, Sonoma State University (7 minutes 37 seconds). This 10 -minute video documents the history of Sudden Oak Death, describes its pathology, and explains what measures may prevent its spread in the future. Video courtesy of Point Reyes National Seashore. The Bay Area Public Broadcasting TV station KQED featured “Plant Plague”: http://www.kqed.org/quest/television/view/250. Sudden Oak Death by Erin Loury from SciCom Slugs on Vimeo.